Ina-Yoko Teutenberg continued her recent run of success on Friday winning Drenthe 8 Van Dwindeloo. Coming off the win at Redlands Classic and perhaps her career highlight, winning Ronde Van Vlaanderen last Sunday, Teutenberg can be very pleased with the way her 2009 season has begun. "If you told me a few weeks ago that I'd win 10 races by mid April I would have laughed at you," Teutenberg joked. "But I had a really good off season and it's nice to start the season like this." 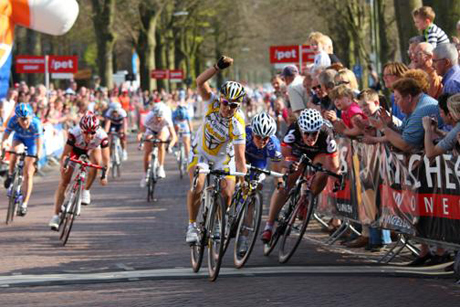 Teutenberg also won Drenthe 8 Van Dwindeloo in 2008 but she said the course had changed. "Today we had a cobbled section 2km from the finish line which made positioning at the end vital," she explained. "Normally the cobbles come with ten kilometers to go. The conditions were also very different in that it was hot for Holland and not windy enough to really split things up." The 140km race saw a few breaks get away mid race, but everything came back together for a bunch sprint at the end. "When we hit the cobbles there was a good attack from Sarah Duster," said Teutenberg. "Nuernberg had to work pretty hard to close the gap and then they went on to do the lead out for Regina [Schleicher]. She started to sprint at 200m to go and I squeezed through a gap to come around her with about 50 meters to go." "I'm quite happy this race is over to be honest, said Teutenberg. "I was really tired today and the race was fast so I suffered a lot. But I'm happy with the result and now I will try to rest up for the World Cup on Monday." 9 Loes Gunnewijk (Ned) Team Flexpoint all s.t. 12 Alessandra D'ettorre (Ita) Top Girls Fassa Bortolo Raxy Line s.t. 16 Sarah Düster (Ger) Cervelo Test Team all s.t. 29 Elizabeth Armitstead (GBr) Lotto-Belisol Ladiesteam all s.t. 32 Janel Holcomb (USA) Team Usa both s.t. 38 Suzanne Kuiper (Ned) Restore Cycling Ladies all s.t. 46 Elisabeth Braam (Ned) Team Flexpoint all s.t. 49 Bertine Spijkerman (Ned) Dsb Bank - Nederland Bloeit s.t. 51 Allessandra Borchi (Ita) Team Italy s.t. 53 Lucy Martin (GBr) Team Great Britain s.t. 58 Eleonora Van Dijk (Ned) Team Columbia High Road Women all s.t. 65 Lea Davison (USA) Team Usa all s.t. 75 Danielle Bekkering (Ned) Team Hitec Products Uck all s.t. 82 Esther Kortekaas (Ned) Restore Cycling Ladies all s.t. 95 Marlijn Binnendijk (Ned) Leontien.Nl both s.t.